The Warren Tech (WTS) Eagles have always soared high – very high. 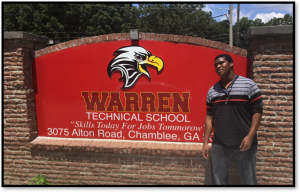 Established in 1984 as the first school of its kind in the state of Georgia, Warren Tech provides quality academics, technical skills, life-application techniques, and employment opportunities to young men and women from every high school in the district. And for nearly 35 years, they have been doing so without an official sign to mark their entrance – until now. This spring, WTS administrators joined student / designer Charles Taylor to unveil the bright red sign that now proclaims the school’s existence to the world. 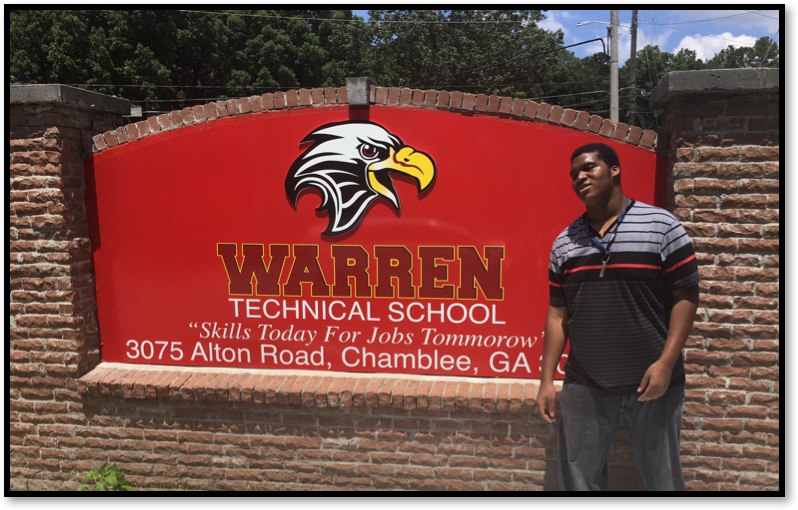 Charles, presently employed as a graphic designer with Atlanta-based ProGraphics, started the sign creation process with a simple sketch while a student in the Warren Tech Graphics Communication program. Later, using ProGraphics-supplied commercial grade equipment, Charles printed and laminated the sign.